particularly in a solar, wind and less so in a micro-hydro power system. During battery discharge, sulfuric acid is consumed and soft lead sulfate crystals form on the plates. Learn more about making your battery bank last as long as possible. If the battery remains in a partially discharged condition, the soft crystals will turn into hard crystals over time. This process, called “lead sulfation”, causes the crystals to become harder over time and more difficult to convert back to soft active materials. Sulfation from chronic undercharging of the battery is the leading cause of battery failures in solar systems. In addition to reducing the battery capacity, sulfate build-up (flooded lead acid and sealed batteries) is the most common cause of buckling plates and cracked grids. Deep cycle batteries are particularly susceptible to lead sulfation. Normal bulk charging of the battery can convert the sulfate back to the soft active material if the battery is fully recharged. However, a solar battery is seldom completely and fully recharged, so the soft lead sulfate crystals will harden over a period of time. Having troubles with a battery in your battery bank? WHAT ARE THE ADVANTAGES OF BATTERY EQUALIZATION? SLOW OR PREVENT SULFATE FROM BUILDING UP ON THE LEAD PLATES – Only a long controlled overcharge, or equalization, at a higher voltage can reverse the hardening sulfate crystals. Normal charging will reduce sulfation, but to remove it, the battery must be equalized. BALANCE THE INDIVIDUAL CELL VOLTAGES – Over time, individual cell voltages can drift apart due to slight differences in the cells. 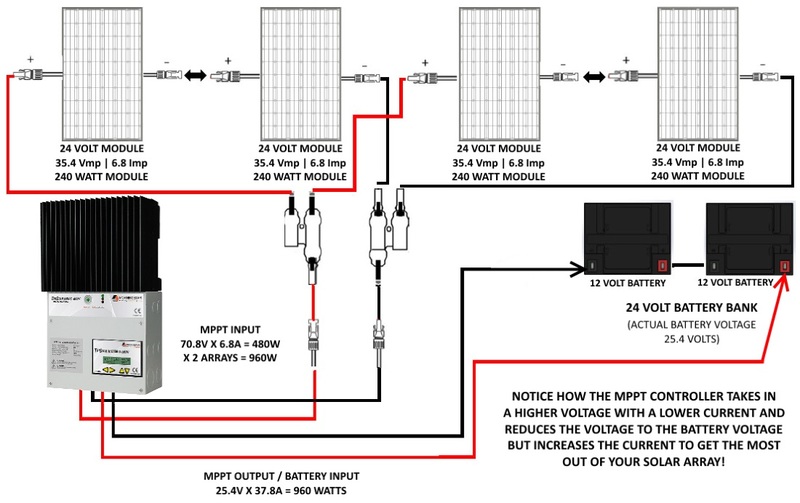 For example…in a 3 cell (6VDC) battery, if one cell is less efficient in bulk charging to a final battery voltage of 28.8 volts (2.4 volts per cell), over time, that cell might only reach 2.30 volts, while the other 2 cells charge to 2.45 volts per cell. The overall bulk battery voltage is 7.2V, but the individual cells are higher or lower due to cell drift. Equalization cycles help make all the cells the same voltage or equalize. MIX THE ELECTROLYTE – In flooded lead acid batteries, especially taller cells (like the Trojan 6VDC L16 or Surrette 6VDC L16), the heavier acid will fall to the bottom of the cell over time compared to the standard 6VDC golf cart battery . This stratification (dividing between the heavier distilled water and lighter battery acid) of the electrolyte causes loss of capacity and corrosion of the lower portion of the plates. Boiling of the electrolyte from a controlled overcharging (equalization charge) will stir and remix the distilled water and acid into the battery electrolyte. HOW OFTEN SHOULD YOU EQUALIZE YOUR BATTERIES? The ideal frequency of equalization charges depends on the battery type (lead-calcium, lead-antimony, etc. ), the depth of discharging, battery age, temperature, and other factors. One very broad guide is to equalize flooded lead acid batteries every 1 to 3 months or every 5 to 10 deep discharges. Some batteries, such as the large L-16 type, will need more frequent equalization charges compared to a golf cart battery. The L16 tends to sulfate more quickly.. The difference in specific gravity between the highest cell and lowest cell in a battery can also indicate the need for an equalization. Either the specific gravity or the cell voltage can be measured with the specific gravity of the electrolyte being the most accurate when deciding whether or not your battery/battery bank needs an equalization charge. The battery manufacturer can recommend the specific gravity or voltage values for your particular battery. SHOULD YOU EVER EQUALIZE A SEALED BATTERY? Sealed batteries do not tolerate equalization, could explode (in very rare cases), and cannot have any distilled water replaced (as there are no removable caps/covers) after an equalization charge. AGM (Absorbed Glass Mat) and GEL CELL BATTERIES WILL BE DESTROYED IF OVERCHARGED. Follow the manufacturer’s bulk/absorption charge recommendations strictly. They are not supposed to gas (vent) and more importantly if they do, you will NOT be able to refill them with distilled water and they WILL be damaged if the voltage is allowed to go higher than the manufacturers recommendations. The best possible scenario when designing your “off the grid water system” is to not need a pump at all! In order for water to flow through your plumbing system, it needs pressure or head. In the first two above examples, head pressure is created as the water source is above the area it is needed. For every 2.2 feet (0.67 meters) of drop, 1 psi (pounds per square inch) or 6.89 kilopascals of pressure is created. A toilet for example requires very little pressure. As long as there is enough pressure for water to enter the toilet tank, it will work. That usually amounts to 1 to 2 psi (6.89-13.78 kPa) as most toilet tanks are 2-4 feet (0.61-1.22 meters) tall. The lower the pressure, the longer it will take to be ready for its next flush but “What’s the rush?”. A shower requires much more. While a shower could operate with as little as 3 or 4 psi (20-28 kPa), it will barely create a trickle and won’t satisfy most people. Many people enjoy showers that feel like they could peel the skin off. A typical home operates somewhere between 30-50 psi or (206.-344 kPa) although this is entirely dependent on preference. That would mean your natural spring or dug well would have to be 66-110 feet (20.-34 meters) above the highest tap or shower nozzle in your home or cottage. It is easy to see how difficult this would be. The pipe run (distance) would likely be very long, adding cost to the system. However, gravity fed systems use no energy and require no maintenance once they are installed properly! Lugging buckets of water from a river, stream or shallow well doesn’t really need much explanation…primitive but how the majority of the world gets their water. Artesian wells cannot be planned. They just happen or don’t. Don’t should be bolded as it is quite rare to drill or dig a well that is under pressure. A well can also be considered artesian if it overflows over the well casing (or whatever material is used to hold water) however just overflowing is not that useful unless your well is many vertical feet (meters) above your home or cottage AND there is adequate flow. There must be both head pressure (vertical drop) and adequate flow (a few gallons per minute/10-15 liters per minute) for an artesian well to help you in your quest for electricity free household potable water.